And now, it's time for something pumpkin. Puuuumpkin. <shamelessly drools and makes Homer Simpson-like gurgling noises> Orange autumn harvest-time delectability. I could link each instance of the word "pumpkin" in this blog post to a different pumpkin-flavored product review...but alas, I shall be lazy. You'll just have to type the word "pumpkin" into the search bar if you're really that interested. I think we have 18 or 19 posts about pumpkin at this point, and by the end of this season, we may have double that. Near the end of October last year, I received several death threats via email from readers who were sick and tired of pumpkin reviews. So I took a brief reprieve from the pumpkin-mania, only to receive an even larger number of death threats from fans who enjoyed the pumpkin reviews and demanded that I persist in writing them. I told those pumpkinophiles "Sure, but you have to protect me from the pumpkin-haters." They agreed. This Pumpkin Protection Agreement (PPA) carries into Pumpkin Season 2014 by default, just FYI. By reading this blog post, you agree to do everything in your power (which, realistically, may be nothing) to protect me from the pumpkinophobes. Mmhmm. And on to the review. This really isn't a pumpkin product, strictly speaking. There's no pumpkin "fruit" in it. Just pumpkin seeds. And pumpkin pie spices. 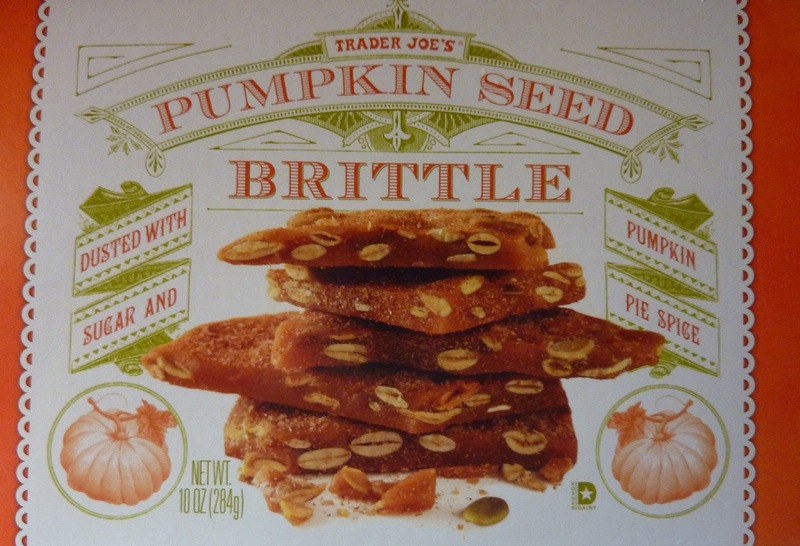 I'm sure this product would be absolutely revolting if it had significant amounts of actual pumpkin in it. But as it stands, it's a pleasantly sweet, salty, and spicy snack. If you're into pumpkin seeds and pumpkin pie spices, you pretty much can't go wrong with the taste. The pumpkin seeds are salty and crunchy, the way they should be. The pumpkin spices are definitely there, but not overpowering. There's enough nutmeg and cinnamon to pick out both of those flavors in the mix, but this treat is sweet more than anything else. 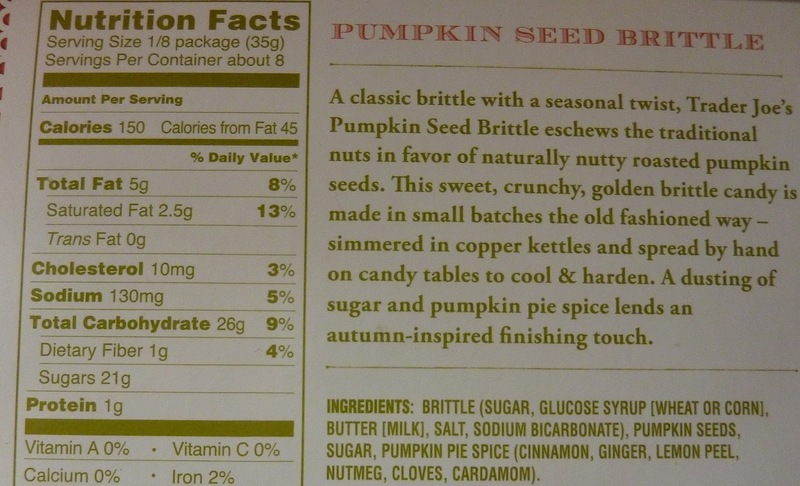 You folks who are into "salty and sweet" should dig the essence of this pumpkin seed brittle just fine. On the down side, I wasn't a huge fan of the texture of this product. It's crunchy and brittle, the way this stuff's supposed to be—and the seeds were perfect as far as I could tell. But the candy part was just a little too sticky, if that makes any sense. When touching it with my fingers, there was a noticeable stick-factor. And while chewing the product, that stickiness was even worse. It almost felt like biting down on a piece of hard candy like a Jolly Rancher or something—like it wasn't intended to be chewed. It stuck to each and every crevice in between my teeth and prompted a massive tongue workout as I tried to dislodge the wads of partially-chewed candy from my molars. If I'd had any exposed fillings or dental work, this snack would have certainly instigated an emergency trip to the dentist. If you have caps, crowns, or shoddy fillings, take heed! 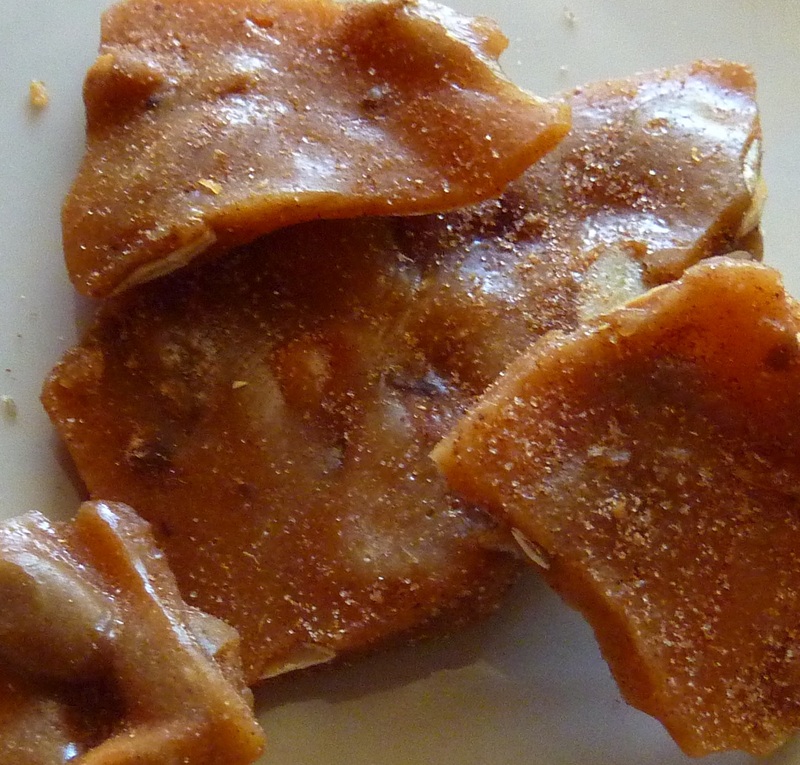 I realize all brittle candy is like that to some extent, but I felt that this stuff was particularly sticktastic. But other than the risk of incidental oral calamity—and an overwhelming desire to immediately brush my teeth after consumption—I enjoyed this product. I give it 3.5 stars. Sonia gives it 4. Staying with family every year in Ca I developed a real taste for this stuff and had to get my sister ship some out to me here in England this year....very American tasting.